It’s summer, or at least that’s what the calendar is telling me. Outside it’s cold, grey and miserable, but inside I want the sun to shine. So what better way than making summery food to get in the mood? 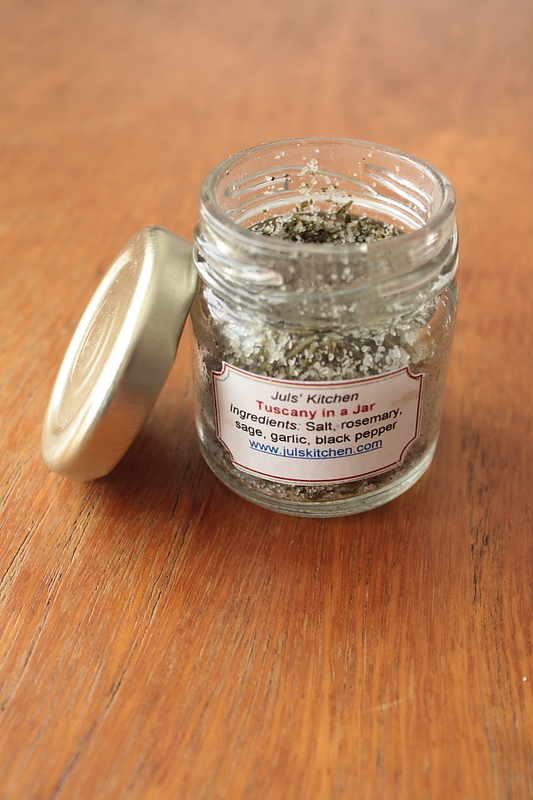 Two weeks ago at Food Blogger Connect, the lovely Giulia of Juls Kitchen gave everyone a little present from her home – a jar of a Mediterranean salt mix (with rosemary, sage, garlic and black pepper), which she labelled Tuscany in a jar. Great stuff, I thought, and got brainstorming on what to make with it. Ratatouille? Flavoured polenta? Sprinkle some on salads? I was lost in thoughts, with my nose sticking in the spice jar, when R. came into the kitchen and asked what I was sniffing. ‘I’m indulging in the smell of summer, and trying to decide what to cook with it.” She took the jar from me, gave it a critical nosing, and returned it to me with a big smile on her face and just said ‘Focaccia’. That’s how this lovely bread came about. I really like Focaccia, but I don’t make it often enough. My first Focaccia recipe was given to me by our lovely Italian neighbour Rosalie. I did quite a bit of babysitting for her children, and one day she had made this wonderful Focaccia for us lot for dinner. It was amazing! I’ll have to dig that recipe out of my old food files and make it again. For the while being, this new recipe will do. I mixed a bit of wholemeal flour into the batter, since I ran out of strong white flour, and I was surprised by what a nice touch this gave the Focaccia. So, thank you Juls for this lovely spice mix. If you want to make it yourself, check out Jul’s recipe. Mix the dried yeast into 100ml of lukewarm water and let it rest for about 5 mins to activate the yeast. Combine the flour and salt in a big bowl. Pour the yeast mixture over and start kneading. (I started off with an electric mixer with dough hooks, but once the mix resembles more and more a dough I find it really hard to work with this and prefer to use my hands to knead.) Gradually add 200ml of lukewarm water and 5 tbsp of olive oil. Knead for a good 5 minutes until the dough is smooth, supple and elastic. Form into a ball. Wash the bowl you just used, try it and pour a couple of tablespoons of olive oil into it. Roll the dough ball in the oil so the whole surface is covered. Cover the bowl with a damp towel and place somewhere warm for 1 + 1/2 hours, until the dough has doubled in size. Once the dough has risen, punch it down. You literally punch into it and watch it collapse. Knead it again for a couple of minutes. Form into a ball and let it rest in the kitchen for 10 minutes, covered with the damp towel. Divide the dough in 2 and place each part on one oiled baking tray. Shape the dough into an oval by pressing it down and pulling it into shape. Cover the dough ovals with a damp tea towel (again? Last time I promise) and let it go puffy for 25 minutes. Now turn your oven on while the dough is rising, 200° C.
Once the dough has risen, oil its entire surface with olive oil. 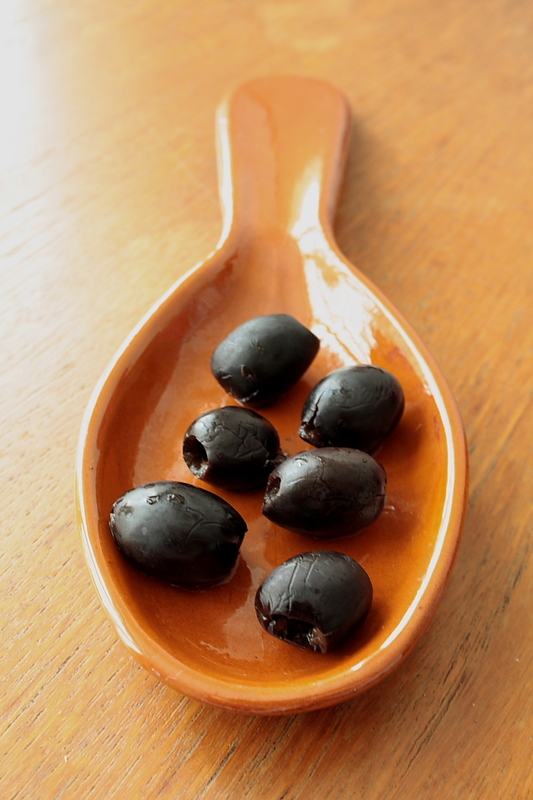 Take a handful of olives and stick them in the dough, making a nice pattern or just randomly. Break some rosemary stalks off and stick them into the dough or just scatter on top. In the end, scatter some Mediterranean salt mix (or plain salt) over the Focaccia. Bake for 15-20 minutes, or until the Focaccia is nicely golden. If you’re not sure it’s done you can use the good old method of sticking a little wooden stick in and if it comes out without any dough attached to it, you’re done! OOOOOHHHH!!! I’m flattered!! My jars are really nice in your picture! I am really really happy that you liked it, and definitely you made the right decision, it is the perfect recipe to taste it! 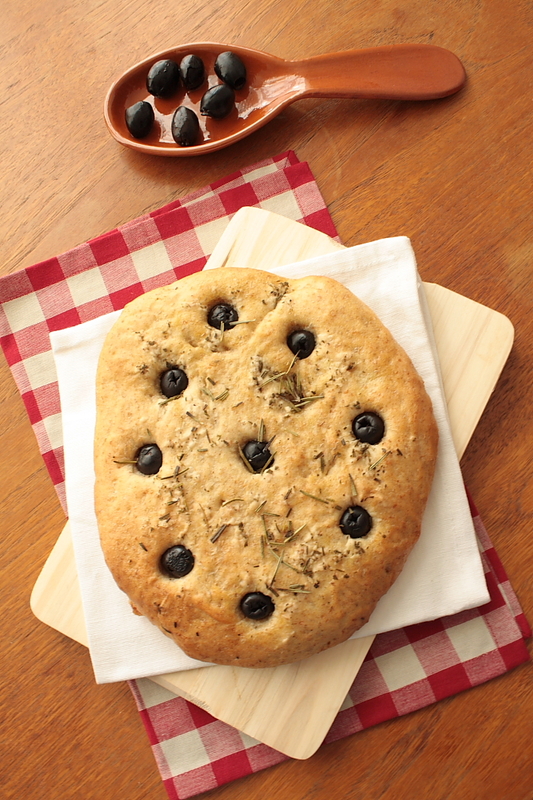 By a very strange coincidence I am making some olive and rosemary foccacia right now! Mine will be different from yours though, so I’ll blog about it and we can compare. I’m going to cut the olives into slivers and mix in with the dough. And my dough has a lot of semolina flour in it as I too ran out of white bread flour. Mm beautiful! And I can tell that it smells and tastes awesome too. It’s my first time at your blog and I love it! Anne this is a gorgeous looking focaccia and loving the ways one can use Juls’ Tuscany in a jar! Hope you have a blast in Berlin – if I did not have other commitments I would have come up for a few hours to see you again! Hope we can do it again though! Oh Meeta, I really, really loved Berlin. Hopefully we can meet up there more regularly in the future… The Kuchen is just too damn good to wait another 5 years to go back! Hi Suzan! Oh I’ve had the most fantastic time ever in Berlin! I fundamentally love that city and the feeling you get from just wandering the streets! I ate a hell of a lot of Kuchen and pastries and also lots of Asian food. Will start working on a post tonight. Unfortunately I only read your comment on my return, will have to check out that Vietnamese place next time I’m there, sticky rice with mango sounds divine! All the best with your move to Berlin, you lucky girl! Thank you Anne – it is a little daunting to move to a new place after living (and loving) London for 13 years! Everyone positively raves about Berlin though so I am excited. I am looking forward to your Berlin post! Anne, it looks so apetizing. Bread iso nurturing. in all its forms. Then you pair it with herbs and olives..well, it can’t go wrong, can it?! 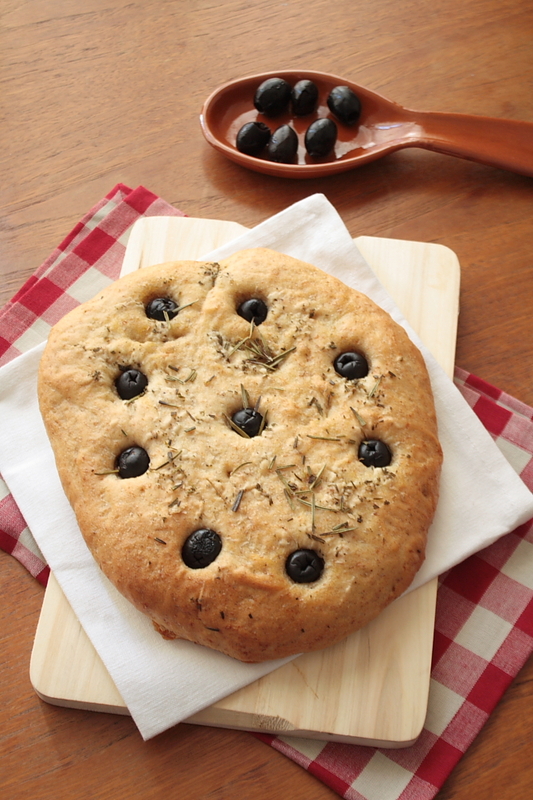 this looks soooo tasty….I love focaccia but I haven’t made my own, yet… I think it’s time I try it!. Thank you M. You should really try it! 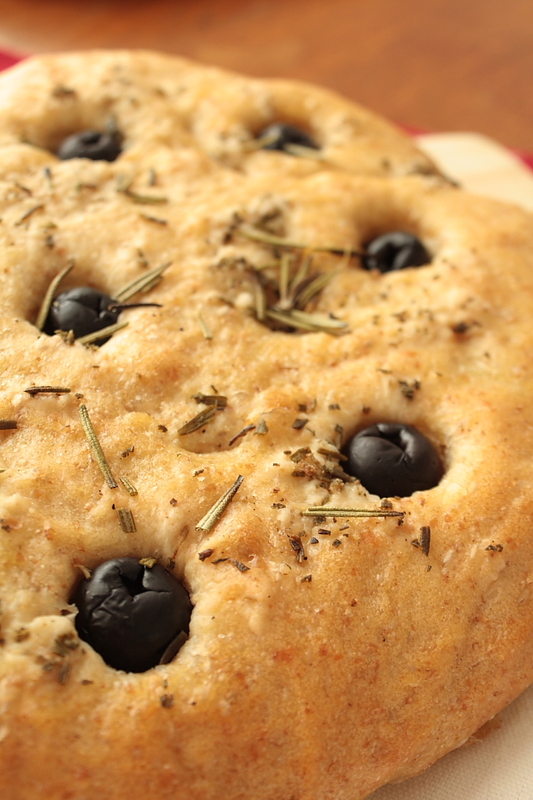 Your photos are always so beautiful, I can’t wait to discover a Focaccia on your site! I keep swearing I’m going to make more bread and try stuff like focaccia but it hasn’t happened yet. Thanks for the incentive!! This sounds like a really good combination of ingredients. Now that I am thinking of things that would work with this idea, I find myself thinking of fresh tomatoes too. I think I just decided on what to have for dinner tonight, accompanied by the cauliflower I just bought. Yes, with tomatoes is fantastic! Especially if you pre-roast them with a few cloves of garlic in the oven before sticking them into the Focaccia. Like that, they’re ‘double-baked’, which really makes them pop! Lovely! Yumm, this looks wonderful, we will give it a try! What a beautiful foccacia. The olives remind me of tiny eyes. I am glad I ran across your blog. This looks awesome! Great photos! Anne that looks amazing. Your food styling is superb..you have a real gift, let alone how delicious the bread looks.I can almost taste it from here! Have a great time in Berlin & I look forward to hearing all about your adventures! Oh thank you so much Rachel! Just posted my Berlin report, still all dreamy about that place! We met yesteday in the celebration of Luxemburg´s National Day. You have a ‘delicious’ blog! 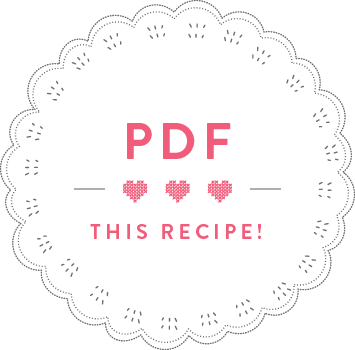 Nice pictures and so atractive recipes! Really nice to meet you at the party! What a night that was! Keep in touch and keep on baking! mmmmmmmmmmmm this looks so tasty and soft *_* i love it! Actually, it was quite crusty, but soft the next day. A little time in the oven made it crusty again, yum! Wasn’t Jul’s Tuscan salt so tasty…I used some for roasting potatoes. I’m not the biggest olive fan, but do love it baked in breads and focaccia. Yours looks lovely…hope you are enjoying the great weather we’ve been having! That salt has been amazing, I’m still using it in cooking, sprinkling a tiny bit on things and seeing how it transforms my dishes. The last one was on fried mushrooms, heaven!